The mortar shells are spread on the forest floor like a buffet. They’re orange with rust and look disfigured, as if the earth chewed at them during their 70-year dirt nap. Sergeant First Class Jānis Smiglis hunches over them with a clipboard, taking notes: Russian. Eighty-two millimeter. High explosive. Then he makes a discovery: of the 30-some rounds unearthed the day before by treasure-hunters with metal detectors, a handful contain white phosphorous. Given oxygen, a speck of it will scorch through armor, flesh and bone until it consumes itself. Smiglis grunts. He’ll need to dispose of them separately. First Lieutenant Aigars Pūce hunches in his parka, watching his men pick through the forest for mortars, bullets, landmines. While the Latvian Land Forces are busy training for future confrontations, Pūce and his techs are busy exhuming and “rendering safe” explosives left behind from the Soviet occupation, World War II and even World War I. Last year, Latvian Explosive Ordnance Disposal (EOD) techs handled 1,099 calls. Pūce’s men, responsible for covering western Latvia, handled nearly half of them – 475. On this frosty morning in February, Pūce and his men are called to Zvārde, a sprawling forest near 1st Platoon’s headquarters in Saldus. Zvārde served as a bombing range during the Soviet occupation, and before that, it was pummeled by artillery in the last months of WWII. Pūce assigned six techs to this call, which is a wintertime luxury. During the dark months when Latvians enjoy the great indoors, they get two, maybe three calls per day. But during the summer, when the country ventures into the forests, 1st Platoon disperse over western Latvia, dealing with up to 17 calls in a day. Every call is different in some small way, but most follow a pattern. First Platoon rolls out from Saldus with whatever they need to do the job – usually a few boxes of M-46, a Swedish plastic explosive, some blasting caps and a detonator. Sometimes they bring along a treaded robot for dealing with situations deemed too risky for the techs. There are several factors to consider when dealing with unexploded ordnance, or UXO: is the bomb safe? Can they move it? Can they “blow it in place,” or do they need to haul it somewhere less populated? But this is 1st Platoon’s backyard, and they feel safe making a few assumptions. Save for some orbiting crows, this patch of Zvārde is empty. They shouldn’t have to worry about bystanders. As for the white phosphorous, the ground is wet enough to avoid ignition. So they get to work. As Smiglis uses measuring tape and calipers to catalog the mortar rounds, Corporal Jurģis Šteinbergs picks muddy bullets out of a mound of excavated earth. The 7.62 millimeter rounds, once meant for Soviet rifles, now go into a bright red shopping bag. He holds up what looks like an old, empty tomato can. It’s a used schrapnellmine, or s-mine, he tells me. Instead of exploding in the earth, he pantomimes, this German mine springs into the air and explodes in a cloud of ball bearings at groin-level. Jurģis suggests the empty shell might make a good teacup. His count concluded, Smiglis recommends digging out hollows under two fallen trees; the trunks will absorb some shrapnel, and help deflect the blast back into the earth. Pūce nods his approval. The techs find two swarthy trunks, dig their ditches and stack the mortars in the earth. They mold sticks of plastic explosive around the rounds; shucked from their brown paper wrapping, the M-46 looks like gray putty. Engineers favor plastic explosives because they’re extremely stable – you can light it on fire, drown it, leave it under the baking sun or in a blizzard, and it will still only detonate when an electrical charge shoots through the blasting cap – and because they’re nearly unrivaled in explosive strength. When they’re ready to rig the explosives for demolition, half the squad falls back while the other half rigs the blasting caps to the radio detonator, stashed behind a log and connected to the plastic explosives a long yellow wire. They stand 800 meters away, observing the tree line. Smiglis holds the boxy green transmitter. He flips a few switches and counts down from five: pieci. Četri. Trīs. Divi. Viens. A beat. Then a thud, low and heavy. And a second thud. A tiny mushroom cloud rises above the tree line. They’ll need to verify that all the explosive ordnance was, indeed, disposed of, so the techs return to the site. The air has a strange tang to it, sweet and sharp, garlicky. The ditches are now craters, the trunks split and splintered. Šteinbergs breaks out his Gerber and tries to yank a finger-sized shard of shrapnel from an oak tree, but no luck. With six men, the job took just over an hour to complete. They pile in the trucks and lumber out of the forest. There’s another job waiting for them on the other side of Zvārde, a big one: a 50 kg Soviet freefall bomb, a dud dropped during the fight for Kurzeme, then forgotten for 70 years – until this morning, when Latvian loggers dug it up. The heart of Kurzeme, also called Courland in English, is mostly flat, mostly farmland, and mostly empty. Tilled fields stretch from the sides of the two-lane roads to the tree line, and long dirt driveways lead to barns and silos. In October 1944, Kurzeme was a warzone. The Red Army had trapped nearly 500,000 Nazi soldiers of Army Group North – falling back after their long, brutal but unsuccessful siege of Leningrad – between Tukums, just outside of Riga, and the Baltic coast, forming the “Courland Pocket.” For the rest of the war, the Germans would hold their ground against six major Soviet offenses, spending scores of bullets, bombs and bodies over farmhouses and tree lines. They surrendered on May 12, four days after the end of World War II. While the surrendered Germans were shipped off to labor camps, the dirt was filled with the legacy of their conflict. Saldus, a midsized city in southern Kurzeme, is Pūce’s hometown. It also hosted some of the deadliest confrontations of the fight for the Courland Pocket, so Pūce grew up knowing the earth held explosive secrets. When he entered the Latvian Army as an enlisted man, the bombs became his vocation. But it’s more, he says, struggling to find the words in English. It’s complicated. “If they didn’t pay me…” he says, then puts one hand on his heart, and the other on his desk. Which is to say, it’s a kind of love. The EOD teams are organized under the Zemessardze, or national guard, though their techs work full-time. The Zemessardze’s mission is to defend the Latvian homeland, and joining up, a Latvian might reasonably expect to stick to the homeland, and not find themselves in, say, Iraq. Yet nearly all of 1st Platoon has done a tour in America’s War on Terror, hunting down improvised explosive devices, or IEDs, on desert roads, or training local soldiers how to deal with UXO. After the terror attacks of September 11, 2001, the North Atlantic Treaty Organization invoked Article V for the first and only time in its history, proclaiming that the attack against America was an attack against the alliance. For Latvia, NATO membership is practical but also emotional, a pillar of their post-Soviet identity. Thus Latvians found themselves patrolling under the Mesopotamian sun, or training Afghan soldiers in Mazir-i-Sharif. As the wars in Iraq and Afghanistan became more complex, IED attacks grew in number and lethality. These homemade bombs, often little more than artillery shells rigged with a detonator, were hard to detect and disarm. The demand for explosive ordnance techs skyrocketed. Pūce did a tour in Afghanistan. So did Šteinbergs – Iraq, too. They speak the kind of basic Arabic and Dari that soldiers bring back from Iraq and Afghanistan. They have nametags in Latin and Arabic script. Unlike the vast majority of Latvians, they can talk about how cold the desert can get at night. The first Latvian casualty in Iraq was an EOD tech; 1st Lieutenant Olafs Baumanis was killed in June 2004 while clearing a minefield near Karbala. Since then, Pūce said, Latvian techs have served their tours without incident. At home, their safety record is impeccable: despite the brisk pace of business, a spokesman for the Ministry of Defense said that nobody, soldier or civilian, has been injured by unexploded ordnance in the past 20 years. Pūce credits it to widespread public awareness. Latvians know that there’s more than mushrooms hiding in the woods, and when they find UXO, they don’t hesitate to call, and they know to keep their distance. The Russian bomb looks like an oversized yam, ocher-colored and rust-bitten. The techs mull over how best to move it when one of them squats, shoulders the bomb and trudges off to dump it a nearby puddle (EOD techs commonly use water to dampen shock and limit shrapnel). The slanting late-afternoon sunlight gives the tall grass a warm, golden sheen, and Pūce indulges in a Latvian pastime by predicting the imminence of spring. Smiglis extends the antenna and does the countdown. This is a different kind of boom, a whole-body boom, the kind that shakes your guts. Pūce sinks to one knee behind a jeep, instinctively taking cover. “Davai! Davai!” says Šteinbergs, leaping into a truck. They tear down the road, and the techs practically skip to the blast site. The crater is big enough to disappear inside. It smells like garden loam and hot metal. The techs nod contentedly while Smiglis pokes around the perimeter, searching for shrapnel. Šteinbergs finds a jagged shard the size of a cigarette lighter; it’s still warm. Back at the headquarters, 1st Platoon knocks the mud off its boots before heading inside. It’s an old building, shabby but functional, much like Saldus itself. They heat water for coffee in the kitchen and tuck into their delayed lunches. At 30, Šteinbergs is one of the younger men on the squad, but he’s a 12-year veteran of the Latvian armed forces. He served as an infantryman for six years, deploying to Iraq and Afghanistan, then transferring to an engineer company. From there, he joined Pūce’s EOD platoon. He prefers it, he said: the unit is more collegial, he said, bound more by mutual trust than military rigor. Naturally, he thinks about the possibility of conflict with Russia. How could he not? You can’t open a newspaper without seeing saber-rattling in the op-eds columns; last November, Defense Ministry State Secretary Jānis Garisons said the armed forces were preparing for the worst, even going so far as to stock the ministry’s Riga headquarters with small arms. Sure, it’s on his mind. But for Šteinbergs, it’s a subject of idle thought: he sees a culvert that might be ideal for hiding an improvised explosive device, should he have to resist an occupying force. He shrugs it off. He doesn’t have time to think about the next war – he’s still dealing with the last two. 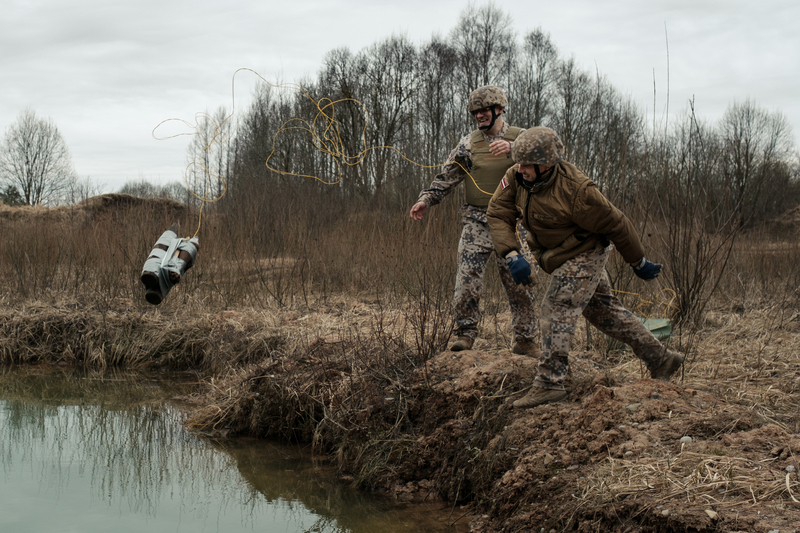 Header image – EOD techs lob unexploded ordnance into a small pond for safe detonation. Water helps dampen the shock of explosion, as well as contain shrapnel.